Wouldn't it be great to blame all your aches and pains on someone else? You could wince at the heartburn that's raging in your chest and blame the girl that you had a feud with in high school. It couldn't be the seventy percent burrito diet you've been eating. Hot salsa can't give you heartburn, you love burritos and burritos love you. Why would flavor want to hurt you? The only answer is that Becky from high school has a voodoo doll dedicated to you hidden somewhere in her home! So next time you've spent all evening knocking back brewskies and you wake up with a horrible headache and a queasy stomach remember that it's not your fault. It's the doll. Then give Becky a call and let her know you're sorry for cheating off her in Statistics class and please, please throw away that Voodoo device! You'll look just like that rascally doll in this sweet yet scary costume. The dress has a burlap texture print and has a snake and stiches printed on it. The dress has a sweetheart neckline that's framed with ruffles and sweet puffed sleeves. The hem of the dress is ragged so everyone can see that you've bee through the ringer. And finally, you'll also get two hilarious pin props so that people will know that you know your Voodoo. Are you ready to come to terms with your magical voodoo side? 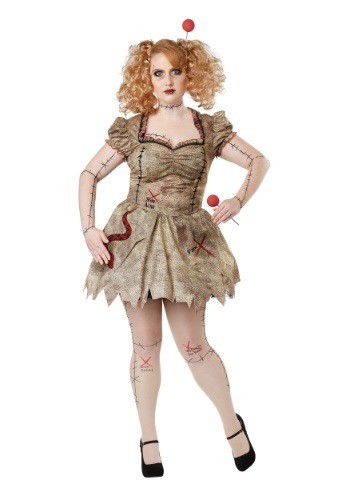 Let it out to play in this voodoo doll costume! You can add a twist to this costume by dressing your hair up like your friend. So she can keep being herself and your can be her voodoo doll. Who knows, maybe she'll even play along by groaning as your stick your needle in the "water on the knee" mark on your tights. I love everything about this costume! It looks just as pictured with great details. It is true to size. Comfortable.